Today is a glorious, wonderful day!! Vic seems better and even walked down the passage to my TV Lounge and then she made us tea!! This child of mine is so stubborn!! She truly does not know the meaning of giving up. The one minute she is contemplating death and the next she is worried about who will inherit the dinner service when I die! In a moment of anger Colin once said “Vic is too spiteful to die” – I don’t think she is a spiteful person but hard-headed – now that is another story. This is one stubborn lady! Vic comes from a long line of stubborn Vikings. Vic’s maternal grandmother was an amazing person. She too was ill most of her life. From her sickbed she “controlled” our family – as Vic now does. My Mom certainly kept the family together. Her immediate family was everything to her! We only truly realized and came to appreciate her strength after her passing. This is Vic’s maternal heritage. ..Brave, strong people who do not know how to give up. 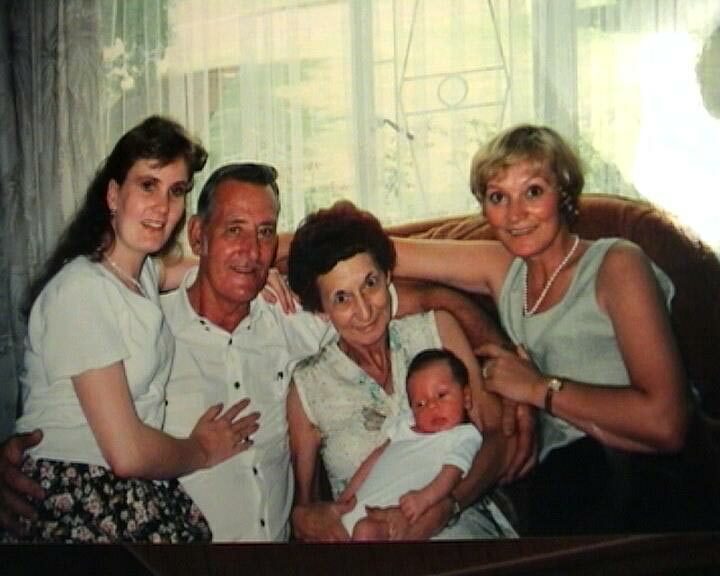 Tienie, Vic’s biological dad, was an amazing person. He lived life to the fullest – every single second of it!! He did not ever want to grow old. He wanted to die young. He died young… He died living! He hated sleeping. Considered it a waste of time. He was generous even in death. He was an organ donor. 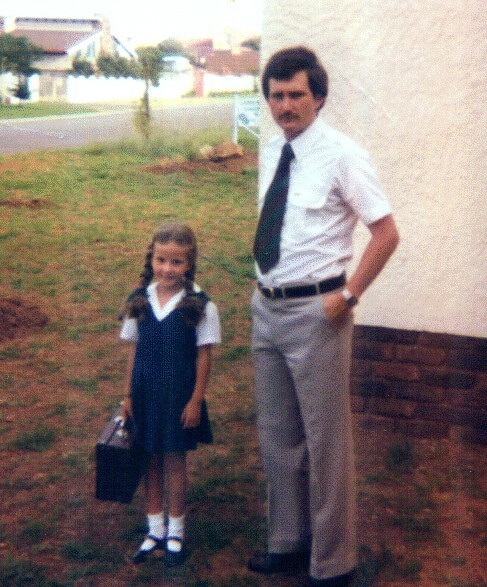 Vic and her father on her first day of school! Tienie and I separated when Vic was very young. He could not accept the fact that the Osteogenesis gene was passed from his bloodline to Vic. Vic’s paternal grandfather died from OI at the age of 35. All the other paternal grandchildren are unaffected. The only affected family member is Vic and now I believe Jared. The curse of Osteogenesis lives on in my beautiful, innocent grandson!